Ship owner Dorian LPG Ltd. said it will look to upgrade the main engines of up to 10 of its very large gas carriers (VLGCs) to dual fuel technology utilizing liquefied petroleum gas (LPG) as fuel. 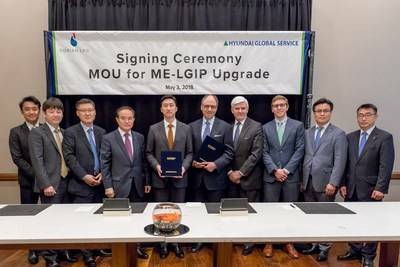 The ship owner has entered into a memorandum of understanding (MoU) with marine service provider Hyundai Global Service Co., Ltd (HGS) to undertake research and preliminary engineering studies for the project. The initiative follows the conclusion of a study announced in September 2017 by Dorian LPG and the American Bureau of Shipping (ABS) to evaluate the use of LPG as marine fuel in advance of the International Maritime Organization's (IMO) mandate to reduce sulfur emissions by approximately 85 percent effective January 1, 2020. Dorian LPG said it believes in the viability of LPG as an attractive and cost-effective alternative fuel that is widely available and inherently compliant with the IMO mandate. As part of its recent new building program, the company proactively included enhancements to its VLGC vessels design to allow for the LPG fuel option. Ki Sun Chung and Kwang Hean An, Co-CEO & President of HGS, added, "We are pleased to be partnering with a first-class organization with whom we have a long-standing relationship. Both HGS and Dorian LPG are committed to the advancement of technology that provides the global shipping industry alternatives to achieve compliance with important environmental mandates."